Guillaume de Machaut - M.E.C. ​​Guillaume de Machaut (d.1377) is one of the undisputed pinnacle geniuses of Western music, and the most famous composer of the Middle Ages. Today his four-voice Mass of Notre Dame is a textbook example for medieval counterpoint, and has served sufficiently to maintain his reputation across shifts in fashion. However Machaut's work is extensive, with his French songs & poetry dominating the fourteenth century by both their quality and volume. A series of carefully prepared illuminated manuscripts, undertaken for members of the French royalty, preserve his complete artistic output. Along with these major sources, various pieces are duplicated in scattered sources throughout Europe. His life and work are thus extremely well-preserved for the period, and his position as the most distinguished composer of the century has never wavered. Machaut was apparently born in the vicinity of Rheims in Champagne, around the year 1300. He is first known as the secretary of John of Luxembourg in 1323, and used the position to travel extensively for various battles and political events. In approximately 1340, Machaut returned to Rheims to take up the position of canon (he had previously been an absentee office-holder) together with his brother Jean. However, he continued to serve John of Luxembourg until the latter's death at Crécy in 1346, and then served his daughter Bonne, who appears in the Remède de Fortune. The remainder of the fourteenth century was an epic of wars and plagues, and one of the few periods in which the population of Europe declined, but Machaut's reputation continued to rise. He went on to serve two kings of France, and was charged with a task as important as accompanying hostages during the English war. In 1361 the Dauphine was received in Machaut's quarters, an exceptional event. By the 1370s Machaut's name was associated with Pierre de Lusignan, King of Cyprus, thus establishing his fame nearly as far as Asia. 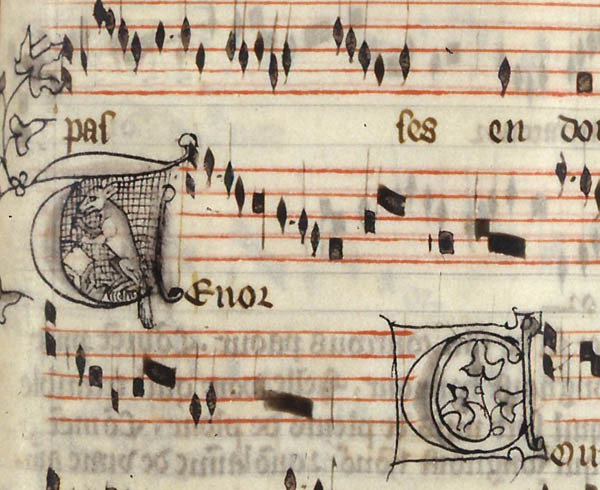 Machaut is frequently portrayed today as an avant garde composer, especially because of his position with regard to the early Ars Nova (a new, more detailed rhythmic notation), but one must also emphasize the masterful continuity with which he employed established forms. While using the same basic formats, he made subtle changes to meter and rhyme scheme, allowing for more personal touches and a more dramatic presentation. Indeed, Machaut's poetry is one of the most impressive French outputs of the medieval era, serving as an example even for Chaucer. The theme of courtly love dominates his writing, becoming heavily symbolized in the guises of such characters as Fortune & Love, and the personal dramas in which they act. Machaut's poetic output, and by extension the subset of texts he chose to set to music, is both personal and ritualized, lending it a timeless quality. Some of the love themes date to Ovid and beyond, from whom they had been elaborated first by the troubadours of Provence and then by the northern trouvères, and so it is truly a classical tradition to which Machaut belongs. Machaut marks the end of the lineage of the trouvères, and with it the development of the monophonic art song in the West. This aspect of his work is found in the virelais and especially the lengthy lais. He also acted decisively to refine the emerging polyphonic song forms ballade & rondeau, and these were to become the dominant fixed forms for the following generations. What Machaut achieved so eloquently is an idiomatic and natural combination of words with music, forcefully compelling in its lyrical grace and rhythmic sophistication. His songs are immediately enjoyable, because he was able to shape the smallest melodic nuances as well as to conceive forms on a larger scale. The latter is reflected especially in his poetic-musical creations Le Remède de Fortune and Le Voir Dit, as well as in his Messe de Notre Dame. One must not lose sight of Machaut's position within the sweep of medieval history, as his great "multimedia" productions had clear precedents in the Roman de la Rose and especially the Roman de Fauvel. It is Machaut's ability to unite cogent and elegant melodic thinking with the new rhythmic possibilities of the Ars Nova which ultimately makes his musical reputation. Although he wrote music for more than one hundred of his French poems, and even for half a dozen motets in Latin, Machaut remains best-known for his Mass of Notre Dame. This mass was written as part of the commemoration of the Virgin endowed by the Machaut brothers at Rheims, and was intended for performance in a smaller setting by specialized soloists. The most striking aspect of the piece is not simply the high quality of the contrapuntal writing, but the architectural unity of the Ordinary sections as well. Machaut's mass is not the earliest surviving mass cycle (there are two which predate it), but it is the earliest by a single composer and indeed the earliest to display this degree of unity. While the chants used as cantus firmus do vary, opening gestures and motivic figures are used to confirm the cyclical nature of the work. Technique of this magnitude is frequently offered as evidence of Machaut's prescience, given the prominence of such forms a hundred or two hundred years later, but the musical quality of his cycle can be appreciated on its own terms. Of course, the same can be said for Machaut's oeuvre as a whole.